and Keep it Off Forever. Master the 22 core principles of healthy, rapid, permanent weight loss and you'll never need to diet again. 70% of weight loss occurs in the kitchen. Using exercise alone to lose weight is extremely difficult. Flash frozen organic fruits and vegetables are not only nutritious, they are also inexpensive and free of carcinogens. There is a specialized part of the brain you can program to keep from regaining any of the weight you lose. Kale is higher in Calcium than milk and contains no bacteria, antibiotics, or steroids. You would have to eat eight oranges today to get the same vitamins your grandparents did from just one. For every ten pounds of fat you gain, your heart has to pump blood through an extra 70 Miles of blood vessels. 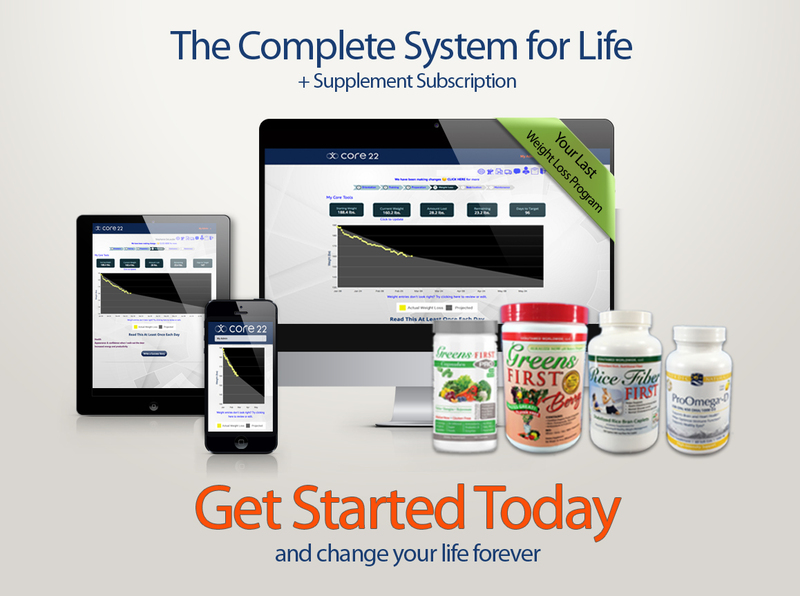 What if there was one program that combined the best of every healthy weight loss strategy ever conceived into one comprehensive easy to use, step by step system? Intermittent fasting, Low Glycemic, meal timing, and so much more. Visualize data designed to guide, motivate, and help you make the connection between your choices and outcomes. 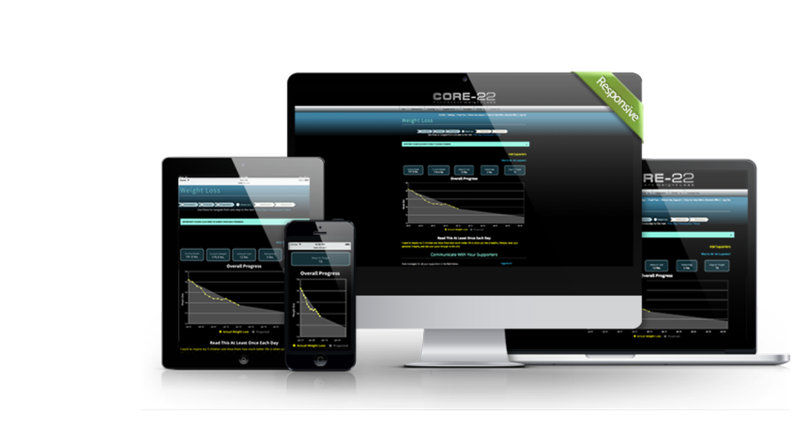 Purchase Core-22 today and have access to it all day, every day, for the rest of your life. Limited time offer! Learn the 22 healthy weight loss principles that will empower you to not just lose the weight but control it for life. Customized food plans and strategies based on your unique profile. Enlist the support of friends, colleagues and coaching professionals to follow your progress through the app. Create or join a group of like-minded individuals to share recipes, track each other's progress, and encourage. Science-based research shows there is no shortcut to healthy, permanent weight loss and 99% of all attempts end in the yo-yo effect where a person regains all the weight. Core’s 4 phased approach eliminates this problem and allows for rapid permanent results. This preliminary phase tricks your body into producing hormones that make rapid weight loss possible. This phase is where you will learn to apply and master all 22 core principles, complete with tools to motivate and track your progress. This phase ensures that your new optimum weight becomes your permanent weight, helping you to avoid the typical “yo-yo” effect. This final phase reintroduces the body to all food groups and teaches you how to ‘eat for life’ while maintaining your optimum weight. "I got my self esteem back and im in the best shape of my life"
"I couldn't lose that last 20 without Core!" "I got my self esteem back and am in the best shape of my life"
"I want to be around for my son!" "Lost 155 pounds and now I'm off all my medications. Life will never be the same." "I finally have a nutritional program I believe in enough to recommend!" If within 30-days of your purchase you are not completely satisfied with our program, simply let us know why in writing and we will refund the cost of the program and any unopened supplements if returned within 30 days of purchase. If you purchase a supplement subscription, it may be canceled at any time.